Now being the creative sort of geek that I am, I had a go at making my own level completely from scratch using a piece of software called Q3radient. 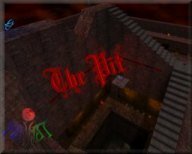 The level (called The Pit) was specifically designed with lots of players in mind and is an open, high power weapon arena with lots of emphesis on accuracy, which as a side effect makes it ideal for railarena games. To install it simply copy the downloaded pk3 into your baseq3 folder. Then all you have to do is look under skirmish and start a game! I hope you enjoy playing it as much as I did making it!